Plants LED grow lights are not only economic in their use but they produce better plants as well. When we compare LED grow lights with all traditional lighting options,we will find that LED grow lights are best choice. So LED grow lights are the lighting of the future of agriculture. If you know how the LED grow lights work, you will find out how they affect plant growth. There are numerous advantages of LED lights over the HPS lamps which were widely in agriculture. To produce light for growing plants,LED grow lights are luminaires utilizing LED chips in a modern and efficient way. Plant LED grow lights come in many shapes and sizes. But the most essential units of LED grow lights are LED chips which have most of the effect on the quality of the light. The two most important factors are spectrum (colors) and photon flux (“brightness”). Since most of the LED grow lights manufacturers can choose the LEDs they use in the lamps, it is important to understand which kind of LED grow light best fits the specific application. To meet the needs of plants,LED grow lights have the advantages compared to traditional lighting solutions. We use expensive IR UV LED Lamp to promotes plants to defense mechanisms. All our LED grow lights have Blue and red Light which is essential light for plant growth. Also Our LED grow lights have optimal full spectrum which includes universal Blue Red IR UV and warm white light. And the 10000K white light produce heat which make your tent be warmer in winter. The LED grow lights need to have durability and great electrical efficiency as well. Our LED grow light can be operating for at least 10-12 hours a day. This makes us to be the reliable LED grow lights supplier. You can choose from a variety of LED grow lights ranging from 10 to 2,000 watts and from 100 to 100,000 lumens. Our LED grow lamps can save you up to 85% in energy usage compared to traditional grow lights. Most of our LED grow light has a lifespan of over 50,000 hours. This will meet the requirements to replace hard-to-reach grow lamps in out-of-the-way locations. Our LED grow light includes COB LED grow lights,full spectrum LED grow lights and LED linear grow lighting. It’s wise choice to convert traditional grow lights into more energy efficient LED grow lighting, with all LED lights containing no mercury. For more information about our LED grow lighting, or to order any of the LED lighting shown below, just contact us. Our LED lighting experts are waiting to communicate with you. As a leading LED grow light factory, we will advise you on our best indoor plant LED grow lights for sale to meet your needs. This is the upgraded timing function USB plug plant grow lamp(with upgraded adapter). You can not only set it up for lighting 3/ 9/12 hours, but also adjust the brightness of the light and the distance between the light and plant according to plant needs.This plant light has a USB connector which makes it convenient to connect to your office or home. This LED grow light extracts the most useful Blue Red IR UV and white light spectrum from natural sunlight to help plants perform photosynthesis better. They adopt LED bead and zener design instead of reflector to ensure if one led out won’t affect others’ LEDs. This is one of our most popular LED grow lights. This is full spectrum LED grow light. This LED grow light adopts Dual-chip(10W) LED which is much brighter and more efficient than traditional 3W and 5W. Veg/Bloom double switches offers 3 light modes to control for full spectrum which provides veg and flower all stages everything they desire in the natural sunlight. Cooling fans and heat sink constitute a powerful cooling system, keep the light cool and quiet. And every LED has a resistance to keep them work separately, extend the lifespan of the light. Our indoor plants LED grow lights include COB LED grow lights,full spectrum LED grow lights and linear LED grow lights. The power ranges from 10W to 2000W. So whenever you’re looking for LED grow light 1000w or 600w,you can find it at AIS. These grow lights will create a sun for your plants. We use high quality LED driver with our LED grow lighting. Also we use innovative cooling technology with aluminum alloy. This will ensure our plant grow lights with 50,000 life span. What is 50,000 hours? If you ran one LED lights for 6 hours per day , it would last for nearly 23 years. So you may never change another light for long period. The traditional HPS grow lights consume lots of energy. They also don’t offer full spectrum. Our LED grow lights can offer full spectrum and they are more energy-efficient. This will help you and your clients to save more energy and money. You do not have to choose between inefficient grow lights of incandescents and fluorescents that contain mercury. Our LED grow light is safe, environmentally friendly and contains no toxic mercury. Our LED grow lights use 10%-30% energy to traditional lights. As we know,consuming less energy results in fewer greenhouse gas emissions being released into our environment. Our LED grow lighting comes with a yoke-style bracket. You can position the LED grow lights in almost any angle for many mounting positions. With our professional technical team, we design our LED grow lights with the most attactive appearance. LED grow lighting is the most gorgeous lighting that illuminates plants and surroundings in colour-rich light. Our LED grow lights are designed to blend seamlessly with any architecture. Also,the proprietary diffusing lens and reflector system delivers an optimal light distribution. Do different plants require different spectrums? We have launched some experience growing a wide range of plants under different combinations of LED grow light colors. According to the experimentation, it is clear some plants such as green leaf lettuce are capable of growing with extremely limited spectrums (i.e. with only red light). In fact, the plants do not grow normally. The plants exhibit significant differences from the same variety of plants grown in natural sunlight. Some plants will not grow well with limited colors of light (even with red and blue included). And without key spectra, normal pigmentation and other secondary metabolites (such as vitamins, compounds related to flavor, THC and CBD, etc.) may not be produced by the plant in normal quantities, or at all. However, if all necessary spectra are included in a light, all plants will grow optimally and produce desired secondary metabolites. AIS grow lights have been painstakingly developed to grow plants of all different types. By adding the “bare minimum” spectra required to just get plants to survive, we successfully grow plants of all species and strains. We have grown over 420 different species of plants under our grow lights. The plants contain representatives from most of the major divisions of the plant kingdom (Plantae), separated by hundreds of millions of years of evolution. And the results are always the same: plants thrive under AIS grow light. The 3 divisions we have yet to test are: Anthocerotophyta (hornworts),Charophyta (stoneworts / desmids) and Gnetophyta (gnetophytes). How much UV light do AIS full spectrum LED grow lights provide? 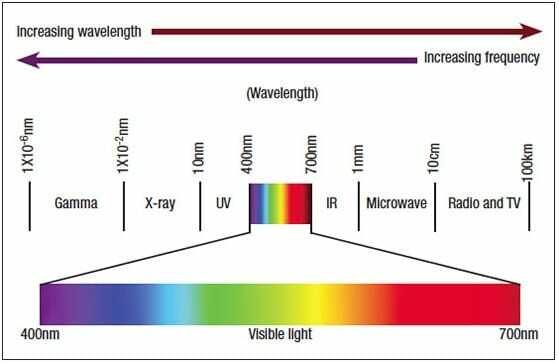 For full spectrum grow lights,4.5% of the total photon flux of the lights is in the 320-400nm UV-A range. As you know, UV light is more energetic than PAR light. 6.6% of the total light energy produced by our grow lights is in the UV range. Some grow light companies claim to have UV light in their spectrum. In fact, they are technically correct- a few stray UV photons created by almost every lighting technology. A typical HPS lamp has about 0.05% of its total photon flux in the UV range. And even incandescent light bulbs have about 0.2% of their total photons in UV. LED lights typically have a tight spectral peak around the wavelength they are designed for. Moreover, they can produce occasional UV photons. 450nm blue LED, in particular, can produce around 0.05% UV photons. This is one out of 2,000 photons they create is in the UV range. These blue LEDs coated with phosphor are the basis for “white”, or so-called “full-spectrum” LED light. They are often called “no harmful UV”. With less than 0.1% UV photons, the level of UV is insignificant. However, some LED grow lights manufacturer claims their lights providing UV light based on this insignificant “leakage” from the blue or white LEDs. Without quantifying how much UV their light produces, it is difficult to know whether or not it is just a trivial, “accidental” amount of UV. 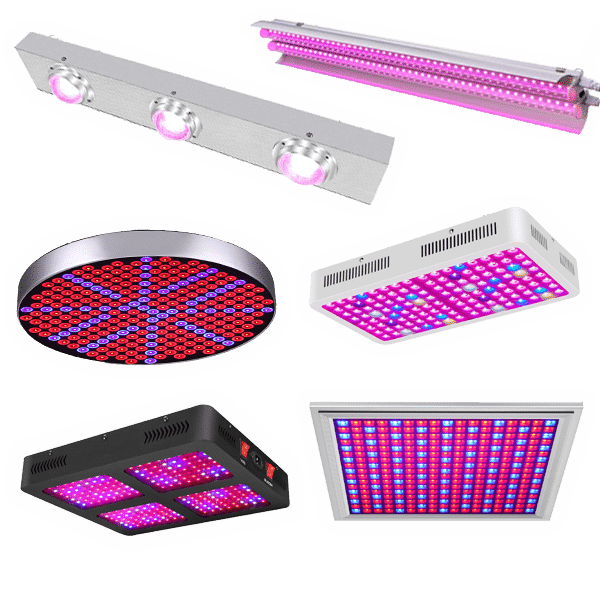 Some of the LED grow light factories even advertises “exclusive UV technology.” But they don’t include any LED diodes that target the UV wavelength range. The UV photon flux of their light is less than 0.06% of their fixture’s total photon flux, a trivial amount; even less than incandescent light bulbs! By including actual UV diodes, our full spectrum LED grow lights provide 75 times more UV light than their “exclusive technology”. Why do you include green color in your grow lights? It is true that green light is reflected more than other colors by the chlorophyll in plant leaves. This is why they look green. But this doesn’t mean plants don’t use any green light. Some pigments in leaves such as carotenes and xanthophylls harvest some green light and transfer it to the photosynthetic process. The small amount of green we include in our LED grow light spectrum also serves as an aid for viewing the plants. This will allow easier diagnosis of issues such as nutrient deficiencies, pest and disease problems. Why don't all of the diodes on AIS LED grow light panel light up? After you received AIS LED grow light, you unpack it, put on your no. 5 welding glasses (safety first! ), plug it in and take a look to check out that beautiful spectrum. You many notice that some of the diodes seem dimmer or not lit up at all. Don’t worry, your light is working perfectly! Our LED grow lights includes full spectrum grow lights and UV LEDs, outside of the visual range. The ultraviolet (UV), deep blue, and infrared (IR) LEDs we include in every grow light don’t appear as bright to human eyes only because they are outside of humans’ visual range. Safety glasses that block UV and IR light can make these LEDs appear completely un-lit. But they are working. When we say our lights are full spectrum, we mean it- and now you can see (or not see) why. Are there any differences growing under AIS LED grow lights compared to HPS? The simple answer is : yes! There is one critical change you will need to make in your growing style to maximize yields under AIS grow lights. You can keep the ambient temperature while the lights are on about 10 °F / 5 °C warmer than you would with HPS. If you grow plants under our lights at the same temperature you grow the plants under HPS, the leaves will be too cold. And you won’t get the full yield you should. Another difference is that plants will stay shorter and bushier under AIS LED grow lights than under HPS. HPS lights’ spectrum causes a hormonal response in plants that induces them to “stretch” or grow longer stems than they would under natural sunlight. Our grow light does the opposite, encouraging plants to grow shorter stems and put more of their energy into growing leaves and flowers instead. The shorter, bushier plants that our lights grow will still yield as well or better than the lanky, floppy plants that HPS generates! Many growers have concerns about running at the higher ambient temperatures we recommend. And we certainly understand them. But the short answer is that it does not cause problems under our LED grow lights. Growing at 85 °F under HPS lights will usually cause heat stress to the plants and decrease yields. It will also evaporate off compounds like terpenes, giving a lower-quality harvest. Experienced growers are also aware that warmer temperatures make insects and powdery mildew reproduce faster. These issues cause seasoned growers concern when we recommend running ambient temperatures in the 85-88 °F range. To understand why these issues do not apply to plants grown under our grow lights, it is important to re-examine why we recommend warmer temperatures with our lights in the first place. The spectrum of our lights is designed to nourish plants as efficiently as possible. And it does not heat up leaves as much as HPS or other light spectrums. Increasing the ambient temperature by about 10 °F / 5 °C is required to get the leaves themselves to be the same temperature as they would be under HPS lights. The leaves themselves are the same temperature. So terpenes will evaporate out of the leaves at exactly the same rate. It does not matter that the ambient air temperature is 75 °F under HPS lights or 85 °F under AIS LED lights. Things living on the surface of the leaves will also be the same temperature. So powdery mildew and spider mites will be at the same temperature whether the ambient air temperature is 75 °F under HPS lights or 85 °F under AIS LED lights. This is verifiable using a forward-looking infrared camera, as we have done in our study of spectral effects on leaf surface temperature. To test our lights, we grow plants with them- a lot of plants. Spider mites occasionally get introduced to our research growing areas, as often happens if you have lots of people visiting the grow. Spider mite infestations are easily controlled and eradicated in our growing areas even though the ambient air temperatures when the lights are on are kept at 85-88 °F. In fact, it seems easier to eradicate spider mites on plants under our lights (even at 85 °F). This is because the UV light in our Phyto-Genesis Spectrum is a natural suppressant for insects and mites. We’ve never had powdery mildew bother any of our indoor gardens under AIS LED lights at any ambient air temperature, although it has grown on plants under lights lacking UV in the spectrum. We have many years of experience growing plants under our lights at the ambient temperatures we recommend. So we can assure you that the higher temperatures do not make insect, mite or mold infestations worse than they would be under HPS lights at 75 °F ambient air temperature. The UV in our spectrum actually suppresses infestations and makes them easier to control. Our recommended vegetative footprints are based on running the light for 18 hours per day. That is 50% more time per day than the flowering footprint assumption. For plants sensitive to the length of the day (photoperiod sensitive), it isn’t possible to provide them with more light by just running the lights more hours per day. But for non-photoperiod-sensitive plants, running the light more hours per day will give them more light. For example, increasing from 12 hours to 18 or 20 hours per day will provide 50-67% more light to the plants. So it is possible to cover 50-67% more area with the same wattage light. Additionally, purely vegetative growth generally requires less energy than flowering or fruiting, so plants can get by with a little less light intensity. Our recommended vegetative footprint is assuming 50% more hours per day the light is running. And the vegetative footprints are 50% larger. The extra hours of light will give the same total amount of light to the plants as a shorter photoperiod with more intense light. If you are using the same LED grow light for both vegetative and flowering growth, we recommend using the recommended flowering footprint size and hanging height for both vegetative and flowering growth. It will give your plants the most light possible. Does LED grow light cause magnesium deficiency in plants? No, LED grow light does not cause any kind of nutrient deficiency. Purple streaks on stems and petioles are a normal response to exposure to ultraviolet (UV) light. The major symptom of magnesium deficiency is usually yellowing, blotchy-looking (chlorotic) leaves, accompanied by purple stems and petioles. When growing under AIS LED grow lights, unless the leaves are chlorotic, purple stems and petioles are not a sign of a magnesium deficiency.They are a sign of a happy, healthy plant. How many LED grow lights can I run on a circuit in my grow? To find out the answer, you need to figure out on what size lights, what voltage the circuit is, and what the circuit breaker’s amperage is. For example,if you use LED grow light 1000w, you should choose few quantity on a circuit. It is important to never overload your circuits with too many things plugged into them. Or the wires can overheat and create a fire hazard. And the circuit breaker can trip and cut power to important equipment in your grow! If you have any doubts, you can consult a local electrician for help. When determining how many lights can be run on a circuit, it is important to also account for all other electrical appliances plugged into the same circuit! Add up the wattage of everything plugged into the circuit and divide by the circuit’s voltage to determine the total amperage draw on the circuit. This amperage must not exceed the safe level for the circuit: 80% of the total rated amperage of the circuit breaker. Only 80% is safely usable because some electronic devices (including our lights) can pull a bit more power than normal when they first turn on. Are AIS LED Grow Lights Full Spectrum? AIS grow lights provide complete coverage of the plant biological active radiation spectrum from 350 to 750nm, including UV and IR. Our grow light contains substantial amounts of UV light, deep blue, blue, green, yellow, orange, red, far red and infrared (IR), making ours truly full-spectrum lights. We do include more blue and red light than other colors because these are the colors of light that plants use most efficiently. But light from AIS LED grow lights still contains enough yellow and green to appear white to the human eye. However, cameras still show a distinct purple tinge to our lights as they are not as adept at adjusting to light without a defined color temperature as our brains are. Other LED grow lights manufacturers using white LEDs advertise themselves as “full spectrum lights”. In fact they are missing UV and deep blue light, and often are deficient in far red and infrared (IR) light. White LEDs are designed for human eyes, not growing plants. They produce mostly green and yellow light, which our eyes see most efficiently, but plants don’t use efficiently. Our LED grow lights are designed to maximize plant growth while still appearing white to the human eye. Our spectrum doesn’t have mostly yellow and green light that heats up plants’ leaves. You can run your growing area warmer with our lights and save up to 60% on cooling costs. Why do you include ultraviolet (UV) in your LED grow lights ? Ultraviolet (UV) light has a wavelength shorter than 400nm. And it contains more energy per photon than light in the 400-700nm Photosynthetic Active Radiation (PAR) region of the spectrum. There may be plenty of reasons to leave UV light out of an LED grow light. UV LEDs cost 10 times more than LEDs in the PAR region of the spectrum. UV light doesn’t count toward PAR / PPFD measurements. And because UV photons are more energetic than PAR photons, it takes more electricity to create them. We get fewer photons per watt out of our UV LEDs than we do out of any other color LED we use. If we replaced our UV LEDs with other LEDs in the PAR spectrum, our lights could be made cheaper. And our PAR measurement statistics would look even better on paper. So why do we bother to include UV in our LED grow lights? At AIS LED we believe in making lights that provide the best possible grow results, rather than lights that look good on paper. Ultraviolet light grows higher-quality plants and increases canopy penetration, so we include it in our spectrum. UV light stimulates several different photomorphogenic responses in plants. Plants exposed to UV light create higher levels of natural sunscreen compounds, such as terpenes, antioxidants, flavonoids, THC, CBD and vitamins. Trichomes are also a natural mechanism for providing protection from UV light. So plants produce more trichomes containing these natural sunscreen compounds when exposed to UV. By including UV in our spectrum, we grow higher-quality plants with richer qualities of what you’re growing the plants for. UV LED grow lights for plants also help increase canopy penetration, allowing for more productive plants as well. Although UV light does not count toward PAR directly, it helps deliver more PAR-spectrum photons lower into the plant canopy. Plants are incredibly inefficient at capturing and converting PAR light into energy that they can use. Most plants only utilize 3-4% of the photons that hit each leaf. Some photons pass through leaves completely, while many others “bounce” off molecules in the leaf and are not successfully captured and used for photosynthesis. These “bouncing” photons typically lose a little bit of energy each time they bounce, which shifts their color more toward the red end of the spectrum, and towards a longer wavelength. If a 660nm red photon bounces inside a leaf on its way through, it would lose a little energy and may become a 750nm infrared photon, and therefore no longer directly usable for photosynthesis (but still possibly helpful due to the Emerson Effect). A photon starting at the top of the canopy as a 440nm blue photon may degrade to a 520nm green photon on its first bounce, then to a 600nm orange, then to a 660nm red. This will give it more chances to be successfully absorbed and utilized for photosynthesis on its way through multiple leaves in the plant canopy. Because UV photons start with even more energy (and a shorter wavelength), they pass through more leaves in the canopy before degrading to an energy level the plant can no longer use. Ultraviolet light increases plant quality and helps deliver more PAR to lower leaves, even in dense plant canopies. That is why we include substantial amounts of UV light in our spectrum. It lowers our photon flux efficiency numbers but actually helps grow better plants. Some LED grow lights suppliers claim to have UV in their spectrum. But they don’t quantify how much they produce, because it is a trivial amount. Growing with UV light costs a little more. But we’re sure you will agree that the better actual growing results are worth it! How does your grow light penetrate plant canopies deeply? Our grow light penetrate deeper than any other grow light of the same wattage. Unfortunately, there is no simple answer to exactly how deep our lights can penetrate. The reason a very simple: every plant canopy is different. Grow Light will penetrate an open, airy canopy better than a dense, full canopy with overlapping leaves. The leaves’ size, shape, thickness, and orientation affects how deep light will penetrate, as well as the spacing of plants, number and spacing of branches, reflectivity of side walls, and many other factors. There are two aspects to light penetration within dense plant canopies: light intensity and spectrum. If the light intensity is weak at the top of the canopy, it won’t penetrate very deep. But in incredibly dense canopies, the spectral make-up of the light is equally important, as the light will need to go through many leaves on its way through the canopy. Photons with more energy to start with at the top of the canopy, such as UV and deep blue, can afford to lose more energy as they pass through leaves and still remain in the PAR region of the spectrum. The raw LED light power of our grow light, coupled with UV and deep blue light, ensures that no matter the plant canopy, our lights will penetrate deeper over the entire growing footprint than any other grow light pulling the same wattage. Our power and spectrum combine to ensure that more photosynthetically. Active photons get to the lowest leaves of your plants to nourish them, maximizing your harvest! what is the height do I need to hang the light? In order to allow the light to “spread out” and cover your entire growing area, it is important to have your AIS LED grow light the correct distance above the top of your canopy. Whether your plants are vegetatively growing or in flower, the correct hanging height is dictated by the size of the area you are trying to cover. Keeping the light too close will cause the corners and edges of the light footprint to be too dim. And our grow lights are much more intense than some other LED grow lights that need to be kept only a few inches above plants. Please remember,having our lights too close can cause “bleaching”. Please note that these are recommended heights. You may be using a light mover or reducing the light intensity to adapt plants grown under other lights. The heights should be adjusted accordingly. Increased grow light height above plants will decrease intensity and give a larger footprint. And hanging the light lower will increase intensity but decrease the footprint. Please call us with any specific LED grow light distance questions for your own setup to nourish them, maximizing your harvest! What temperature should I run when using AIS grow lights? You need to run your growing area warmer with our LED grow lights than with HPS, MH, CMH/LEC, fluorescent, or even white LED lights. Because our grow lights is optimized for what plants use most efficiently. It does not warm up the leaves as much as HPS or even natural sunlight. If the leaves are kept too cool, the plant won’t metabolize as efficiently, and yields will suffer. For Cannabis plants, we recommend keeping ambient air temperature at about 85 °F / 29 °C while the lights are on if you are not supplementing CO2. And for grow rooms with CO2 supplementation, we recommend 88 °F / 31 °C as the ideal ambient air temperature while the lights are on. For the lights-off night period, our lights are not influencing the temperature of the plants at all. So you want to keep the same night temperature you would run with HPS or other lights. How many plants can I grow under a grow light? The answer depends entirely on the size of the plants! The number of plants that can be grown under a light is the number that would fit in the appropriate flowering or vegetative footprint we specify for the light model. Most commonly-grown plants can be maintained at different sizes through pruning. And the size of determinate plants (those which die after flowering) is dictated by the size they were when flipped into flower. So there is no standard number of plants that will fit in any given area.It is all about how big you want to grow them! What are the flowering and vegetative lighting footprints based on? There are hundreds of thousands of species of plants, covering a huge range of light intensity and duration requirements. We simply cannot provide recommendations for every kind of plant. So we had to base our recommended LED grow light footprint sizes on the plants most commonly grown under artificial light. For plants with a lower light intensity requirement, such as lettuce, the lighting footprint coverage can be larger than what we recommend. Plants requiring more light intensity such as most Cacti would require a smaller lighting footprint to get enough light. Do AIS LED grow lights work with 220V / 240V? Yes, our lights will work with 110/120 volts and 220/240 volts. Our LED grow lights can work with wide range 85-277VAC. All you need is the right power cord to plug into the outlet. For example, for USA customers, our lights come with a heavy-duty 14 gauge 8-foot North American 120V cord. But we have other lengths available for both voltages here on our website. Why do you have fans in your grow lights? HPS, MH, CMH / LEC and other high intensity discharge lights increase in efficiency as the bulb gets warmer. Much of their light is generated by super-heated gasses inside the arc tube. Cooling these bulbs decreases their efficiency, even though it is necessary to keep your grow room from overheating! LEDs make light in a fundamentally different way. LED light directly convert electricity to light. The cooler the LED, the more efficient this process is.You will get more photons per watt from a cooler LED than if the temperature is increased. LED lights also degrade at a rate directly linked to the temperature they run at. The warmer they are, the faster they permanently lose light output. Some of the LED grow lights suppliers claim fan-cooled LED grow lights are “inferior”, that they are not engineered properly. Or they point out that fans are moving parts that can break. They conveniently omit the fact that they are sacrificing efficiency and LED longevity by not actively cooling their fixtures. In the fine print of many of the usage instructions they recommend maintaining air movement over their fixture. In other words, aiming a fan at it- because they didn’t build one into the fixture themselves. Some even have fine print in their warranties that invalidates the warranty of the light if it is allowed to overheat. Or it is run in an environment that is “too warm”. AIS LED grow lights utilize a patented, redundant system of high-quality fans to keep our LEDs running as cool as possible to maximize efficiency and longevity. There is no need to get your own fan to aim at the fixture as with passively-cooled lights. Our grow light fans are rated for a 80,000 hour life; 8 years if run 24/7. So failures are incredibly rare. And even if one or two fans fail, the remaining fan(s) will keep the LEDs cool. Unlike passively-cooled LED grow lights, we also include a backup system which will turn the LEDs off if the room gets too warm. This will prevent causing permanent damage. There is no fine print in our warranty regarding operating in overly-warm conditions! If anything, by sacrificing efficiency and LED lifespan, the passively cooled LED grow light fixtures are “not properly engineered” and “inferior”!